For the first time ever, UJA Federation of Greater Toronto is organizing a contingent to New York, New York for the 50th Annual Celebrate Israel Parade and you are welcome to join us. And, if you have family or friends living in the New York City Region, why not have the ultimate family reunion by joining us on Sunday, June 1st, and participate in this historic event? Even if you don’t, why not come anyway and join the fun? We especially want to connect to the many Torontonians, especially college students and young professionals, in the New York region and have them join us. 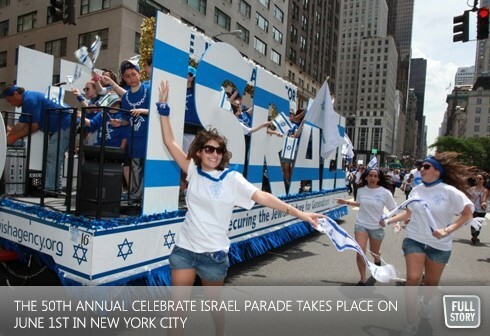 Join the more than 100,000 proud participants who will be parading up Manhattan’s Fifth Avenue in celebration of the Jewish state. Kicked off by the blowing of shofars, the Parade, witnessed by one million spectators, includes colorful floats, marching bands, celebrities, politicians, and various other participants. Details will follow soon as to when and where participants will meet to begin the parade together, under the Toronto banner, so be sure to register today!